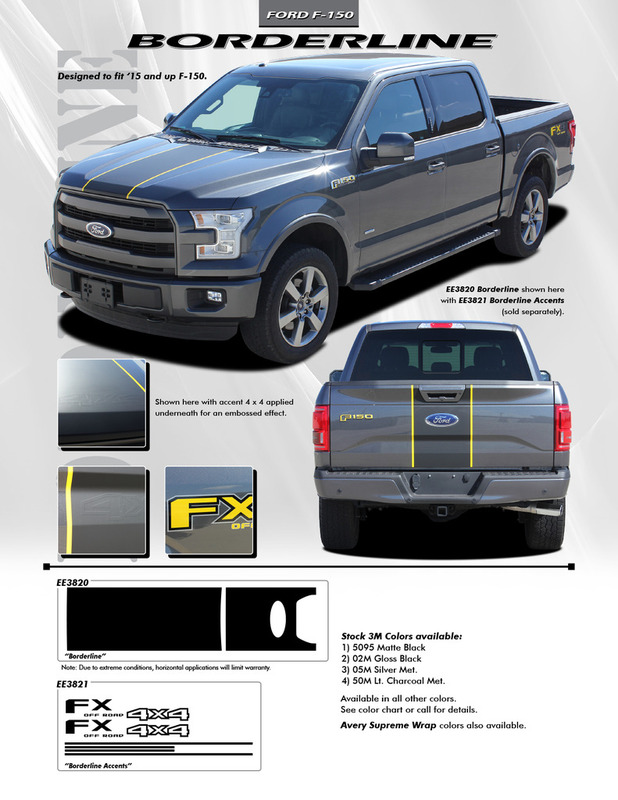 The BORDERLINE Vinyl Racing Stripe kit for the Ford F150 2015 2016 2017 2018 2019 Ford F-150 truck are factory OEM inspired Ford Truck Decals and Stickers that will transform the look of your F-150 truck almost instantly. The Borderline Ford F150 Pinstriping Ideas for the Ford F150 Truck Center Accents Decals has been precision cut from the very best Ford F150 fx4 decals to give you a high quality finish that will last for years. The quality of these Ford F-150 Series Borderline factory style Ford F150 decals and emblems will astound you! They are the same high quality that would get from a Ford dealership, but without the Ford dealership price! These really are the best quality Borderline Ford F-150 side door hockey style rally stripes vinyl graphics and decals kit that money can buy! Fastcardecals.com TEXT US Today!